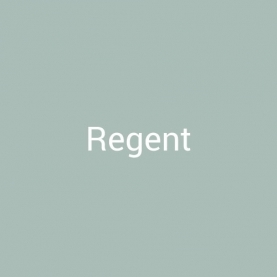 At 6’5” wide, the Regent is one of the most popular sizes in the Robinsons greenhouses range. 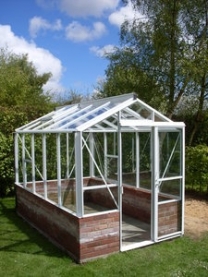 The standard Robinsons eaves height of 5’6” gives you and your plants ample headroom and also room for an optional full-length, high-level shelf (which many greenhouses can’t accommodate). 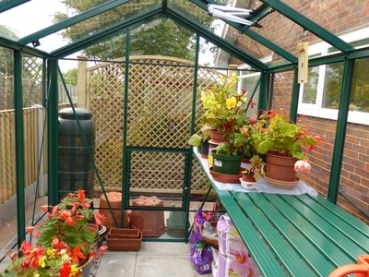 Using the market leading Robinsons low profile glazing system, the 4mm toughened glass is held in tightly with the PVC capping system which is actually screwed into the box section Aluminium glazing bars. 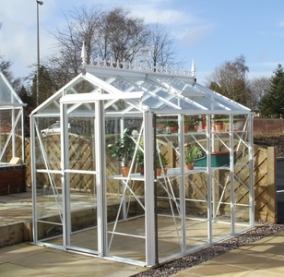 There are many cheaper greenhouses in this size range on the market, but none manage to mix the qualities of strength, elegance and practicality quite so well as a Robinsons. The design of a Robinsons is uncluttered because vast amounts of extra bracing are not needed to shore up an already extra strong frame. 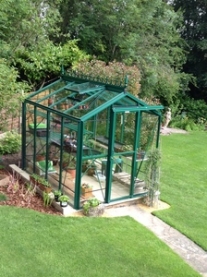 This gives an elegant finish, which makes pottering around in your greenhouse a relaxing and most satisfying pastime. Add an extra Victorian-style touch.